No bins, no camera, no birds for a spiffing few days of culture in Amsterdam with Mrs D, but you never really stop birding. It was just a day after I’d spent a toe-numbing six hours dipping the Yorkshire Pine Bunting, complete with still raw memories of a fogbound Tuesday that made the bird’s appearance 40 minutes after I’d left as painful as they were inevitable. 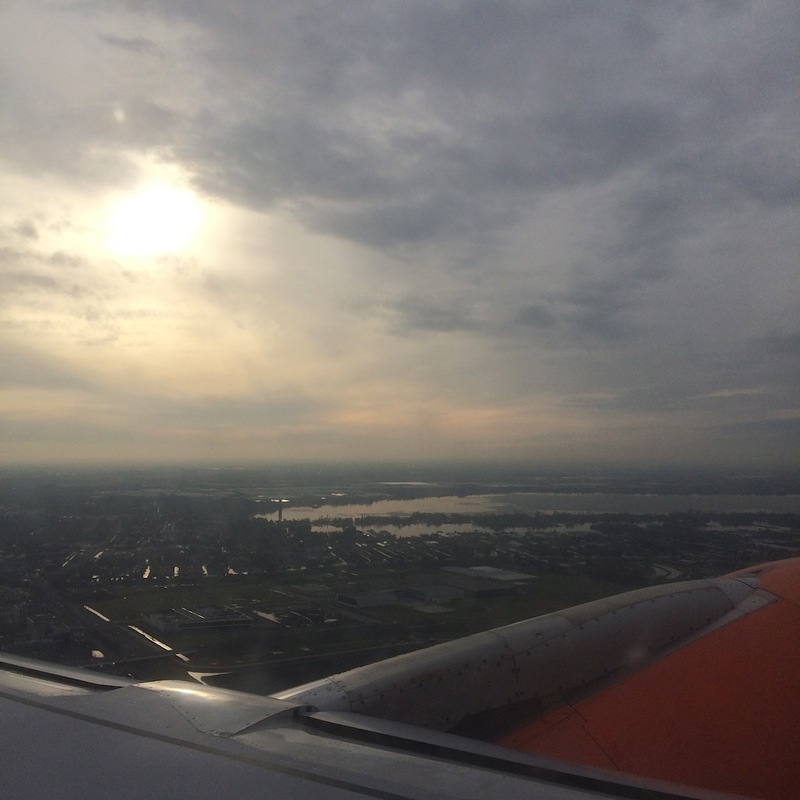 Now it was Wednesday and we touching down at Schiphol, trundling past frozen pools and dykes on the outer limits of the airfield. As the airbus tax-ied (??) slowly along the perimeter of this vast airport I saw a large pale raptor perched up on the airport fenceline just off the wing – the juv Rough Legged Buzzard considerately waited until we were right on top of it before flying to reveal that lovely tail, black belly, wing pattern, blonde head and mantle – what a stunner. 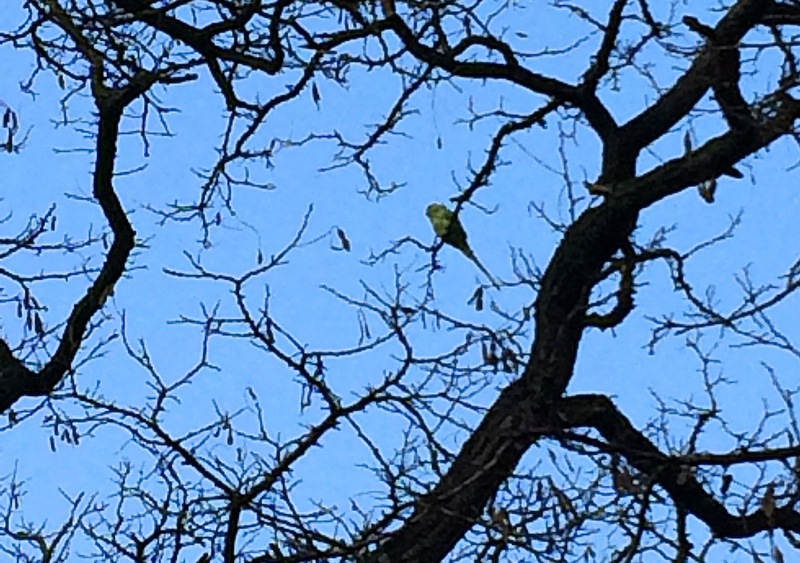 That’s birding – some days good, some not so. Amsterdam was stuffed with Ring Necked Parakeets squealing over a deep frozen city, the usual gulls and Cormorants, Starlings foraging amongst piles of frozen ice by the markets, and while it was bursting with Van Goghy culture, the Rough Legged Buzzard was something else…anyone know how regular they are at Schiphol? I found a few references but how reliable are they in winter? Kestrels, Coot, Moorhen, corvids and gulls around the runways too – quite birdy for an airport. Low grey skies. Marshside. Gloomy, misty, ever-darkening. 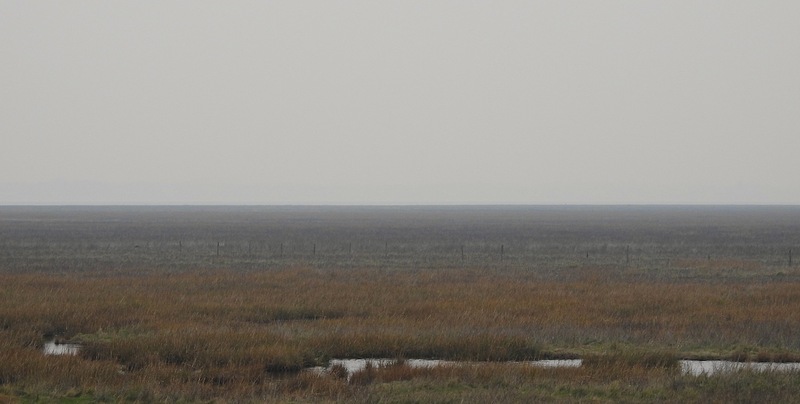 The marsh dispiritingly empty from Sandgrounders. Raw cold. Traffic. Night in the afternoon on Crossens Outer. Howdy Phil. 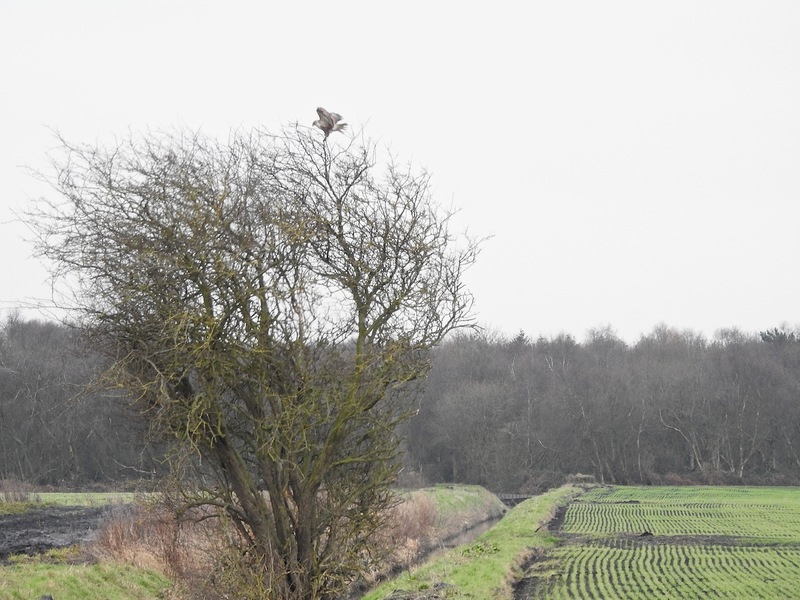 Two Common Buzzards. The small Hen Harrier. Great White Egret. Merlin. Howdy Graham. Howdy John. Pinks, Golden Plover, Curlew, Lapwing, Blackwits. Back to Dempsey Towers. 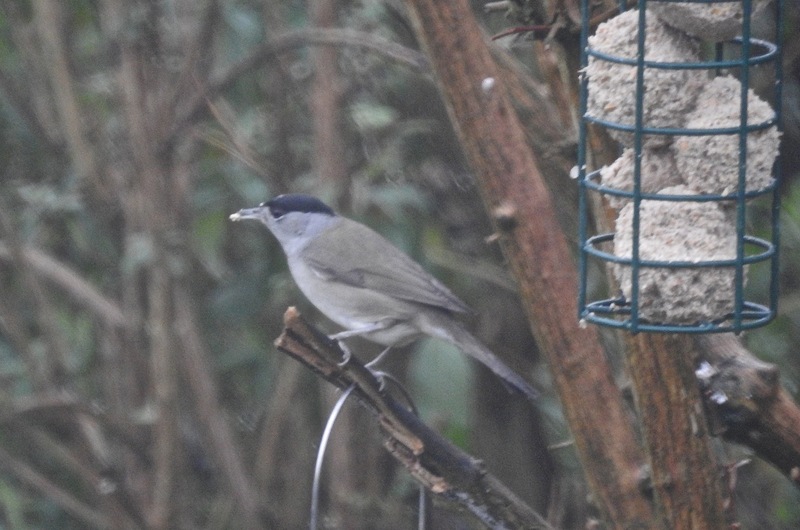 Blackcap, Redwings, Pheasant and Goldcrest. Shudda, wudda, cudda. Groundhog Sunday. 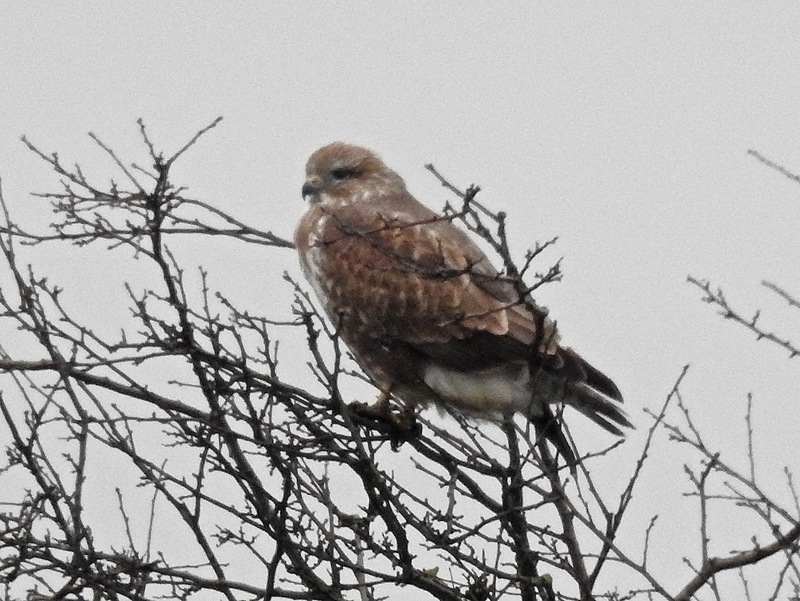 I watched this pale Common Buzzard for awhile this afternoon as the grey hours gave way to an early dusk. Plex probably isn’t the best place to be on a murky winter’s Saturday afternoon, but at least the tweed was concentrating its partridge-blasting efforts on the Withins for once. 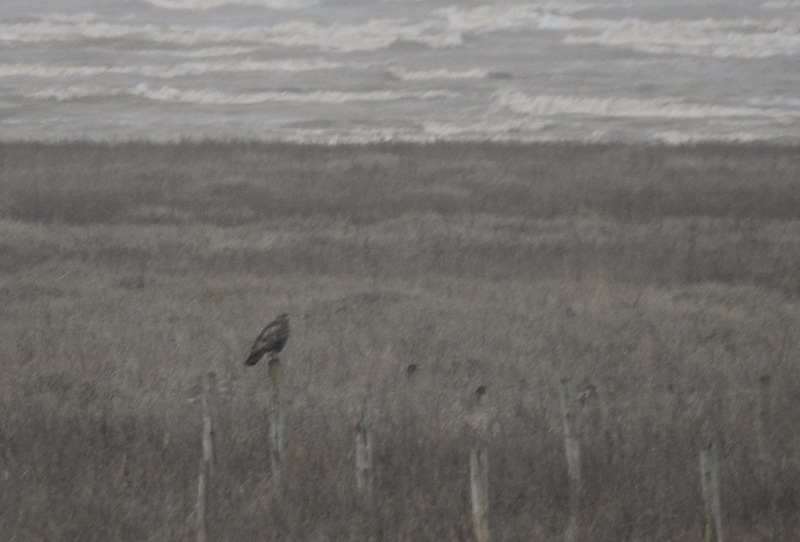 The black soil, low grey skies, browned dead vegetation and flat horizons hardly inspire the brightest of thoughts out there, especially in a week like this, but the buzzard distracted me for a short time. 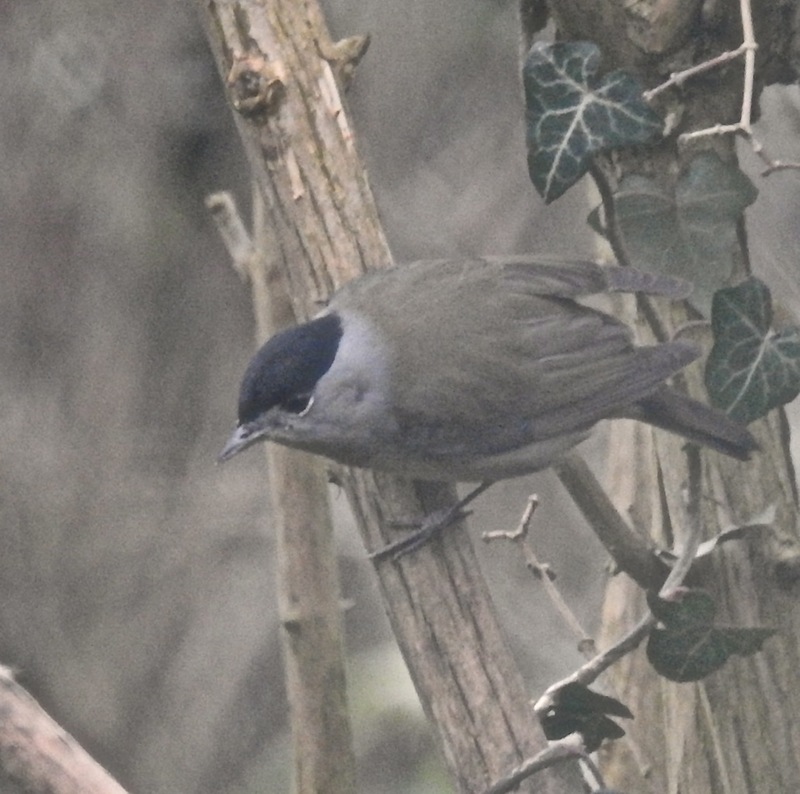 It looked pale, as youngsters often do, as it repeatedly sallied down onto a sown field opposite Gettens Farm to run about the green shoots, presumably taking invertebrates. Three Little Egrets were flapping about – the most I’ve seen on Plex I think – but then two came over Dempsey Towers later (garden tick) too. Not enough Pinks to play with, with just a few small family groups, and the rest in the air heading off to roosts. Perhaps 4,000+ Common Scoters (too far out to work through as ever), 15+ Great Crested Grebes, 6-7 Red Throated Divers, 3 Scaup and 5 Red Breasted Mergs was the best I could manage. I held my breath for a quick examination of a tideline cetacean corpse on Monday which revealed the fourth record of Risso’s Dolphin for Lancs and Cheshire. Not sure how significant a corpse record so far gone is really though – it looked like the remains had been floating around the Irish Sea for a looooong time. Things didn’t look too promising when our guided walk set off from Crossens this morning – despite a 9.9m tide, the outer marsh was never really threatened by inundation, which was what the lovely folk who joined me were hoping for. There was still plenty to look at while the pitiless wind stole what warmth we had left in our fingertips as we walked south down the Coast Road, with two Ravens, Rock Pipit, three Common Buzzards, the big female Peregrine and the titchy Hen Harrier all on the outer marsh. I shouted to make myself heard over the traffic, pointing stuff out and my guests gradually froze their bits off, but still listened politely as the cold seeped into their bones. The inner marsh was surprisingly quiet (in Marshside terms that is – there were stacks of Lapwing, Wigeon and Teal, Blackwits etc). Huge thanks must go to RSPB warden Alex and intern Barry for laying on tea and coffee at Sandgrounders, which defrosted us a tad before we set off again. Merlin, small groups of Skylarks and the loose flock of Pinks were strung out before us as we trudged south. Shame we didn’t have time to pop into Nels, but we were walking to a timetable, which of course went out of the window when we got down to Hesketh Rd and found a crew of birders ‘scoping a Tundra Bean Goose amongst the Pinks. Muchas gracias as ever chaps. 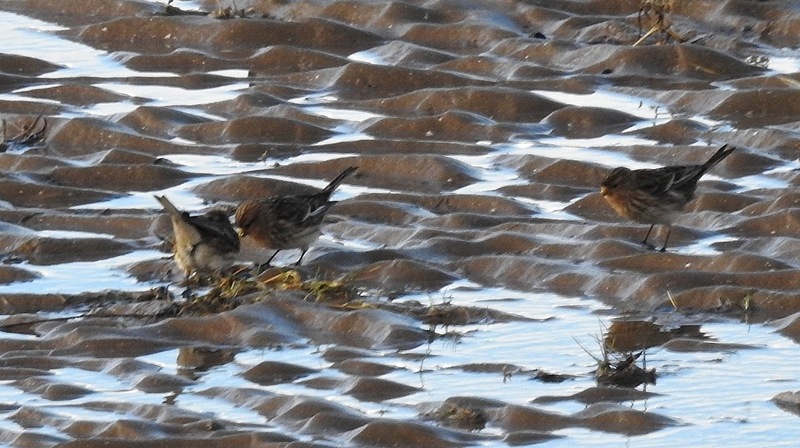 The Twite flock was mooching around off Fairways, occasionally landing on the seawall and the nailed down Med Gull was hustling punters for bread and scraps on the Marine Lake, immediately south of the bridge as usual. Not bad as days in the office go. You can’t see them – but they can’t see you either. Dense fog and drizzly grim are never the best conditions for birding, but I had a spare hour today and decided I’d give it a crack anyway. 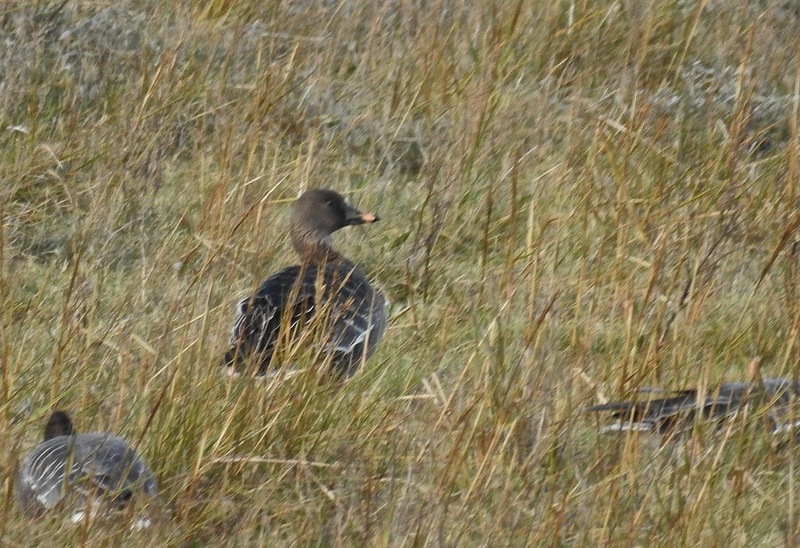 Marshside was a great big grey duvet, with occasional Wigeon, and things weren’t much better as I headed through Banks. 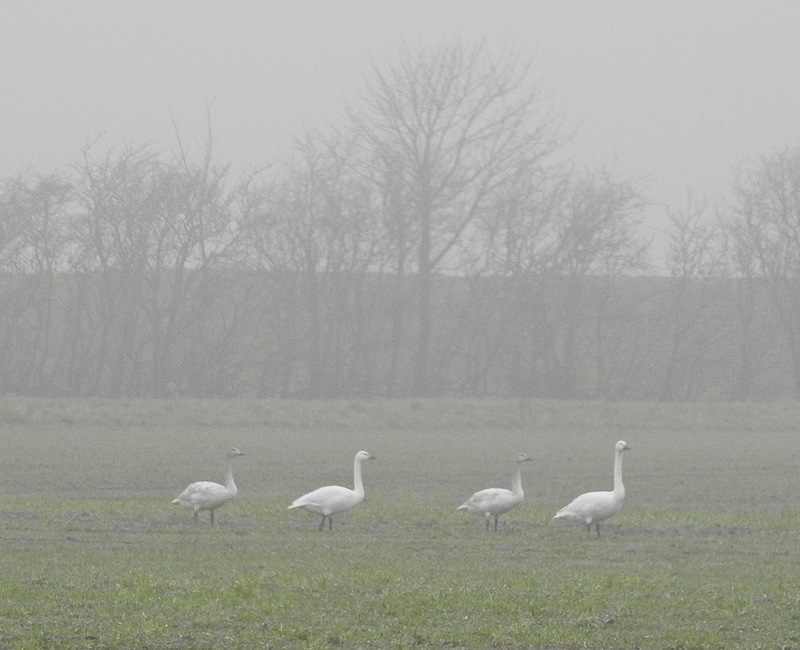 Caught up with the wild swan flock opposite Old Manor Farm (just before the Hesketh Out Marsh turn-off), although it was not easy to go through them in the fog. 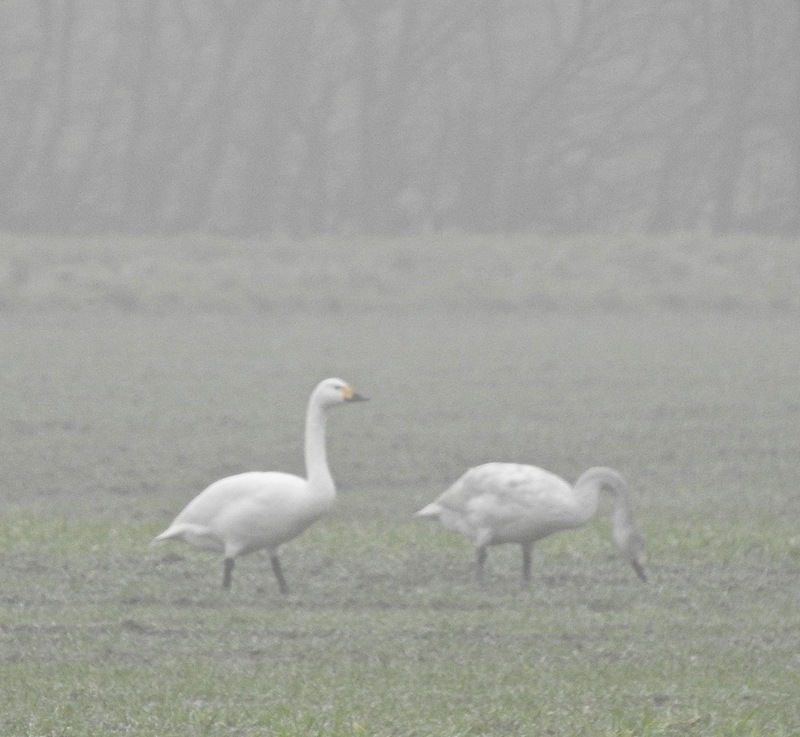 There were about 80 Whoopers in total – or 80 white waddling blobs with long necks when the fog rolled back in anyway, and with them at least two small groups of Bewick’s Swans (smaller blobs with shorter necks in the mist), which was what I was after. 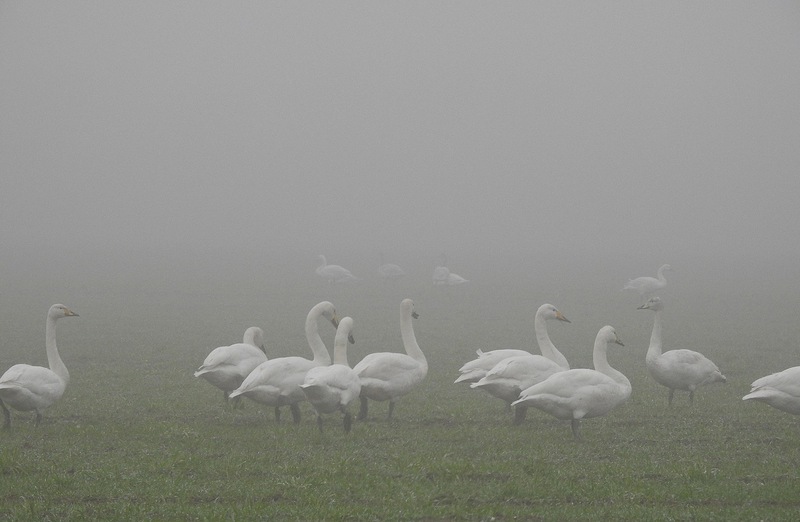 Managed a few misty snaps in a brief moment of brightness before the murk enveloped the herd again. 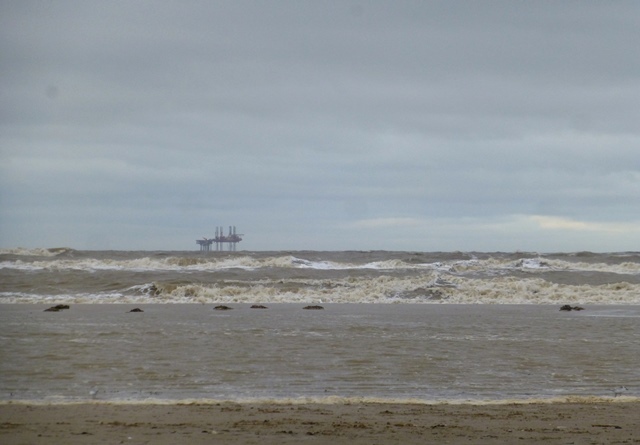 Gotta start the birdy year somewhere, so after a refreshing few days on the east coast with too much rain, far too many other liquids and not enough fly-by Waxwings, I gave the rising tide a crack at Ainsdale over lunch today. It was way too dark, and mucho choppy, while the brisk cold south westerly made it hard to scan the troughs for very long. 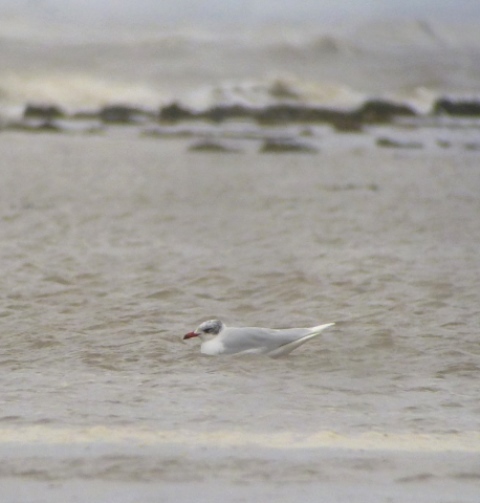 Plenty of Common Scoters offshore, Cormorants and the like, but I was soon distracted by a nice adult winter plumage Med Gull, with a fine five o’clock crown shadow bobbing around in a nearby channel. All was well until a prize doofus on a blow-cart spooked the roosting gulls and my lunchtime white wing drifted up the beach to hunch into the wind looking as miserable as only a cold gull can after the beach has had a good winter scouring. I had hoped for a few more gulls today (although Meds are always cool), but there were only about 150 in two loose groups, thanks largely no doubt to the blow-cart bandit. There will be other days….